A few weeks ago my lovely mum and I took a trip to the wonderfully historic city of York. We shopped till we quite literally dropped and ate so much that I am still suffering from a hangover of rich food, sugar overload and far too much wine. Was it worth it? Hell yeah! The Filmore & Union is a blueprint of the cafe that I fantasize about owning one day. It is beautifully styled in white and dove grey, has soft blankets available for us chilly souls to wrap up in and most importantly features the healthiest and tastiest menu I have ever seen. Their utterly gorgeous food represents how my ideal self would eat all of the time – instead of which I often indulge in fish fingers on white bread and bourbons! The Breakfast menu is ideal as it satisfies the taste buds and that sense of smugness I get from a healthy meal. Your morning options at this wondrous eatery include porridge with apple, honey, berries and seeds, skinny ‘full English’, boiled eggs with home-baked bread and chutney, egg white omelette with turkey or tuna, smoothies and if you are very healthy you could have a hemp protein pancake! 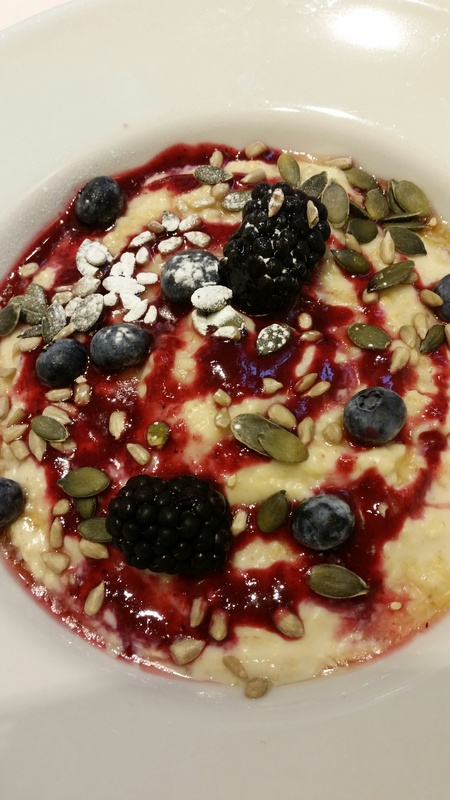 Just take a look at my porridge – it is a thing of beauty and set me up for the day with just the right level of smugness achieved thank you. It has to be done – or so I was told by anybody and everybody. Betty’s Tearoom is an institution, a national treasure if you will. The story goes that the founder of Betty’s travelled on the maiden voyage of the Queen Mary. So enchanted was he by the splendour of the ship that he commissioned the Queen Mary’s designers and craftsmen to turn a dilapidated furniture store into his most sophisticated branch. On Saturday the queue was around the block and I just couldn’t bring myself to joint the scone throng. We did take the plunge on Sunday despite still having to queue outside for a short time. Having been given the menu, bizarrely whilst we were still outside on the street, we had already ruminated over the choice of cakes and settled on a sultana scone with clotted cream and jam served with tea. The Interior is indeed rather amazing and you are definitely transported back to the 30’s – art deco, large green palms and waitresses dressed in starched white with black aprons. Taking tea is an extravaganza of silverware and I loved the wee daub of honey to take with your tea if you wish. The scone was …………………. a scone. It really wasn’t a very special scone, though it was very pleasant. I think for me Betty’s is a brilliant experience but it is all about the historical fanfare. So it was decided that a scone’s a scone for a’ that. The Best Cake of the Trip Award goes to CARLUCCIOS IN FENWICKS http://www.fenwick.co.uk/visiting-the-store-york. Though not overly impressed with Fenwicks itself, we were rather taken with their first floor restaurant Carluccios. We stopped there for a break in the relentless shopping spree that was Saturday. There were a number of cakes to choose from which where the size of my head so we opted to share this rather impressive apricot and almond tart and a lovely velvety cappuccino. 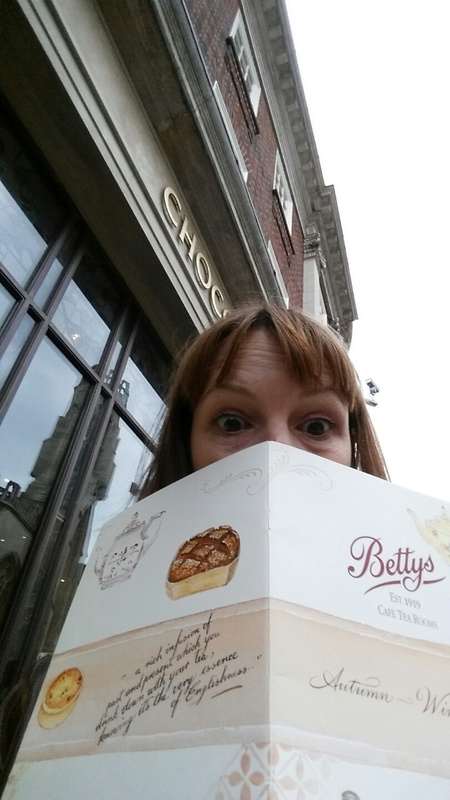 This was beyond doubt the best cake of the trip – sorry Betty’s! The pastry was fantastically short and perfectly sweet. 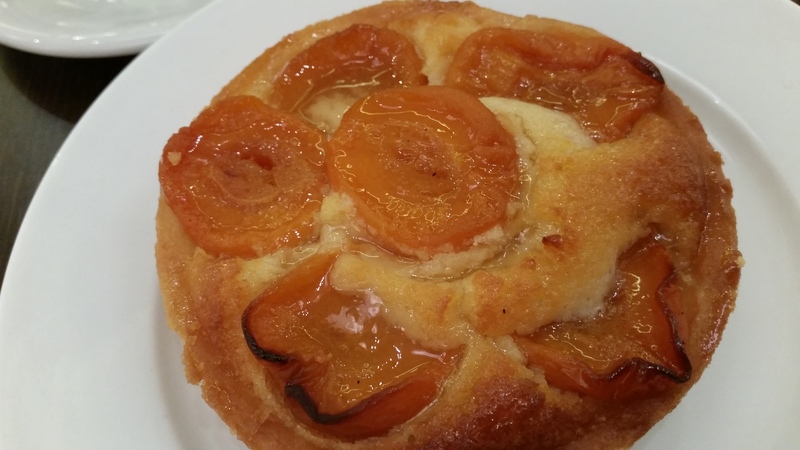 The almond sponge was delightful and the apricots which topped it all off were glazed and glorious. I am not a baker and am never sure how to describe why a cake is wonderful. To be honest I just know that when all that wonderful baking science comes together magic can be made. Magic was made in this department store in York. Lucky Days is an interesting and somewhat confusing concept cafe. 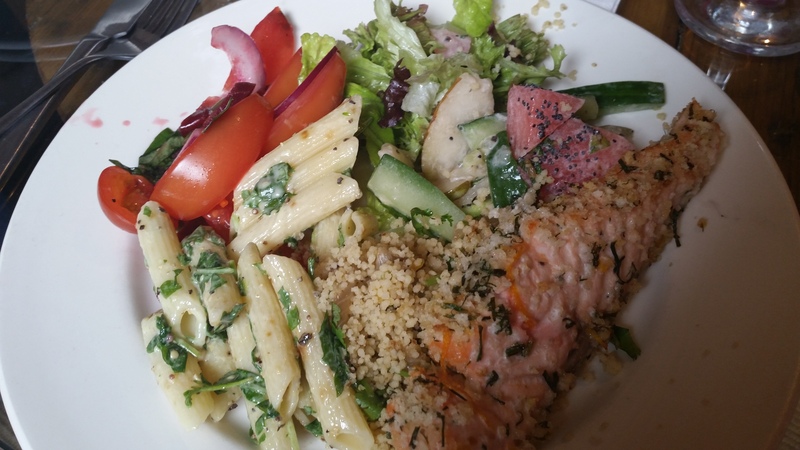 As well as the usual array of Panini there are mains which take the form of a piece of meat or fish and with this choice you are served all six – yes six of the house salads. You inform one lady what you want to eat and then trot over to another counter to pay and order a drink. Then you have to wait for your drink and a waitress to be guided to your seat. Like many places in York this restaurant is rather vertical. Yes yes there are plenty of seats upstairs the cheery manager beamed and so we trustingly followed the waitress up a steep narrow stair case – then another and oh yes another. Senior GT was dripping her glass of wine by this point as she gasped for oxygen. When we finally reached the aptly named ‘loft’ we found one available table with one chair and one bean bag. It was as my mum says ‘different’. But after a while I was quite happy with the arrangement and mum declared her chorizo panini the best she had ever had. My poached salmon with the amazing array of salads was fantastic. There were combinations that I would never dream of such as strawberry and broccoli – but by jove they worked. Delicious. I had pre-booked this restaurant on the strength of its Trip Advisor reviews in an effort to avoid my endless indecision. Too often I spend hours wandering around streets brimming full of wonderful eating possibilities, whilst my mum invariably goes slightly mad with hunger. My mum is great and claims that she is not a fussy eater, in reality she is possibly one of the fussiest eaters I know and it can be tricky to find a restaurant that will really genuinely make her happy. However she adores Italian so I felt that I was on very safe ground. Add to that the fact that taxi drivers and hotel staff were all in agreement that this was the best Italian in York – I was feeling smug. 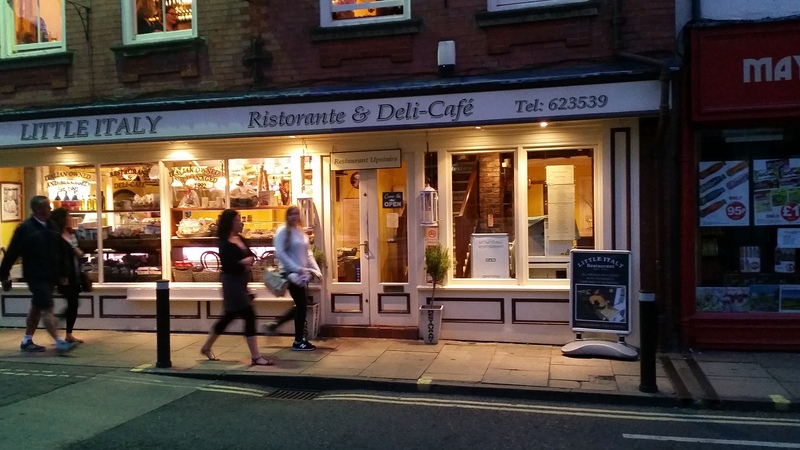 Little Italy is a family restaurant which houses a downstairs deli from where the fantastic anti-pasti meats are carved and an upstairs restaurant. From the outside looking in Little Italy is fabulously welcoming. The lighting is perfect and gives the restaurant a cozy and intimate feel, the interior decoration is warm and Mediterranean and the candlelight plentiful. I would say that this is perfect first date territory. I loved it before I had even taken a bite. The menu offers a bounty of Italian delights which include one or two firm favourites along with some more unusual pasta dishes. The Secondi Piati included such beauties as salmon served with a light white wine, cream and tiger prawn sauce and duck with Cointreau. I opted for a home-made smooth chicken liver pate enriched with brandy, served with toast, home-made onion chutney and a crisp leaf salad garnish. I followed this up with egg pasta ribbons (freshly made on the premises) with sautéed mushrooms, courgettes, onions, fresh tomato, basil, garlic and white wine, finished with rocket leaves and parmesan cheese. Everything was top-notch in terms of presentation and flavour and the service was second to none. If I was lucky enough to return to Little Italy I would probably push the boat out and opt for one of the secondi piati dishes rather than the pasta fresca. It was however the fresca (fresh ) element of the pasta that drove my choice and it was rather wonderful. Categories: Uncategorized | Tags: York | Permalink.